Asthma symptoms, which include coughing, wheezing, and chest tightness, are common in an asthma attack. Sometimes asthma is called bronchial asthma or reactive airway disease. · Coughing, especially at night, during exercise or when laughing. · Any asthma symptom is serious and can become deadly if left untreated. 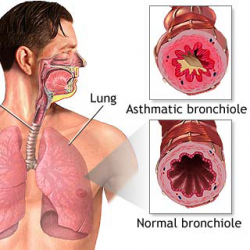 Homeopathy treatment helps for Asthma. And helps to prevent further recurrence also.